The Grosses Gewächs tasting featured a range of whites, like Riesling and Silvaner, and reds, like Pinot Noir and Lemberger. Some standouts included wines from Beurer, Haart and Nik Weis. Each August, Germany’s VDP, an association of some 200 leading wine estates around the country, hosts a preview tasting of their new-release Grosses Gewächs (GGs)—the dry wines from what they have deemed to be their top-tier vineyards. With expectations mixed for the 2017 vintage, I attended to get an early overview of what would soon be coming up in my blind tastings. 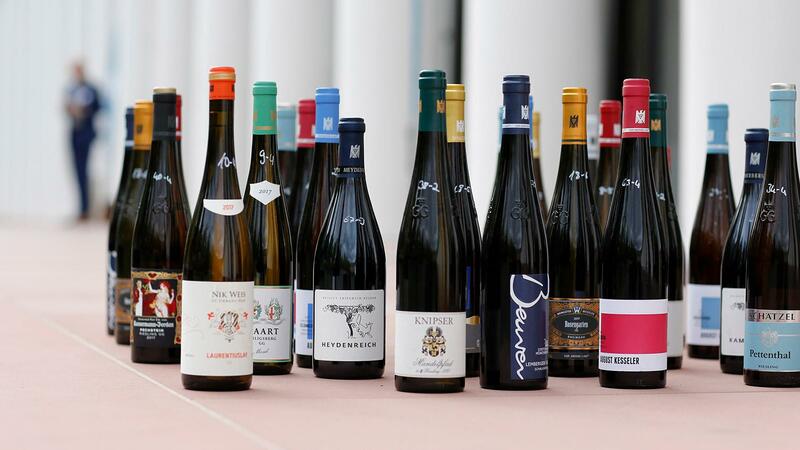 The three-day event in Wiesbaden presented 424 wines spanning five vintages, 2013 through 2017. I tasted nearly 350. The best wines came from patient growers who sacrificed quantity for quality when rain following a very hot summer resulted in the early development of rot; they meticulously removed bunches to protect healthy grapes, allowing them enough hang time to reach full polyphenolic ripeness. However, some wines were lean, dominated by green acidity and lacking complexity, indicating they were harvested too early. Other examples were astringent, with bitter herbal flavors, possibly a consequence of gray rot. More than 400 dry wines from around Germany were tasted over three days. The Pfalz and Rheingau regions were the most inconsistent, but in the former, Philipp Kuhn and Ökonomierat Rebholz showed quality, while interesting wines came from Spreitzer in the latter. Nahe and Rheinhessen shone, with Schäfer-Fröhlich and Emrich-Schönleber and Wittmann and Keller starring in their respective regions. The Mosel was successful too; Peter Lauer, C. von Schubert, Haart and Nik Weis St.-Urbans-Hof delivered some of my favorite collections. Despite the inconsistencies, the good news is that 2017 delivered some of the finest dry Rieslings from Germany ever—expressive, balanced and elegant, versus the more muscular 2015s. A rising trend among producers is holding GG Rieslings an extra year or more before release, allowing them to better integrate. Some of the pioneers are Mosel’s Dr. Loosen, Pfalz’s Dr. Bürklin-Wolf and Reichsrat von Buhl and Rheingau’s Peter Jakob Kühn who, to my palate, delivered the most attractive examples from the 2016 vintage. Besides Riesling, nine other varieties were on display. I was impressed by the examples of Spätburgunder (the German name for Pinot Noir), most of them hailing from the 2016 vintage, with gems back to 2013. I found the 2016s charming, with silky textures and attractive aromatics and fruit flavors—structured, yet approachable. The 2015s showed depth and firmer tannins, presenting complexity and power. Both vintages demonstrate the quality evolution of the variety in Germany. From Franken, Silvaner, once Germany's most-planted white variety, consistently showed outstanding quality in 2017, with velvety textures and mineral expressions. The best examples were Rainer Sauer Silvaner Franken Escherndorfer Am Lumpen 1655 2017 and Zehnthof Luckert Silvaner Franken Maustal 2017. The varieties less common in Germany were also praiseworthy. A distinctive Pinot Gris from Württemberg especially struck me. The bronze-tinged Beurer Grauburgunder Württemberg Stettener Pulvermächer-Jungen GG 2015 exhibited multilayered character, floral and spice aromas, and herbal and tropical fruit flavors. Bernhard Huber Baden Chardonnay Bienenberg GG 2016 was another stunner, reminiscent of Chardonnays from France’s Jura region, displaying prominent acidity with savory herbal and mineral character. One category on the rise is Lemberger—known as Blaufränkisch in Austria, where it is the leading red variety—particularly from the Württemberg region. My favorites were edgy, floral examples from Beurer and Rainer Schnaitmann’s heftier, herbal versions. All wines considered, this is a good era for German wine lovers.